Self-harm isn't just taking a blade to your skin to expose blood. 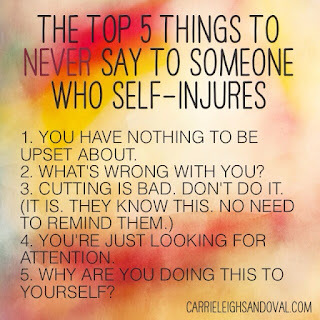 Someone who is self-harming may be burning, poking, scratching, hair pulling and/or not letting existing wounds heal. Some people think self-harmers are attention seekers because why don't they just kill themselves and get it over with already? That's not the goal. I used to self-harm by cutting. When that wasn't enough, I tried burning. Scars are hard to explain to others when they're visible. That's not to say it is the only reason I stopped. Not a day goes by when I'm deeply depressed where I don't think about doing it again. In my personal experience, I wasn't harming because I wanted attention. In fact, nobody knew I was even doing it unless I opened up about it. I was just really good at hiding it. Most are. I'm an introvert so anything I can do to fade into the background is a priority. For me, self-harm was an instant relief of built up pressure and anxiety. It made me feel something when it felt like I would never feel anything other than depressed ever again. How did I stop? The truth is I haven't stopped completely. I don't cut or burn my skin anymore and haven't for many years. My existing wounds never heal. If I get a mosquito bite, it's an excuse to scratch until I bleed and a wound to pick at over and over again to keep new skin from growing back. My upper back is ridiculous and an embarrassment. I have inflicted my own wounds by scratching and reopening them every single day. Sometimes I do it mindlessly because I really do want to stop. I'll may be sitting on the couch, watching TV, and I'll start scratching until I look down and see blood gathered beneath my fingernails. It's automatic. For a time, I was getting my nails done every two weeks. Have you ever tried to scratch an itch with gel nail tips on? It's nearly impossible and when you figure out how to do it, it's not worth the money you spend twice a month to ruin it. So it's one possible antidote. But an expensive one. Medication helps, of course. I'm in a much better place today than I was three weeks ago. That's definitely the medication doing its job because I haven't changed a thing in my day to day life. Doctors and therapists over the years offered some advice on ways to inflict pain reflective of self-harm, without leaving a permanent mark. A few examples are holding a piece of ice in your clenched fist or pouring hot wax onto your skin. Both are good solutions and do hurt, but it wasn't ever instant or enough for me. I'm honestly not here to tell you how to stop or explain why people are doing what they do behind closed doors. 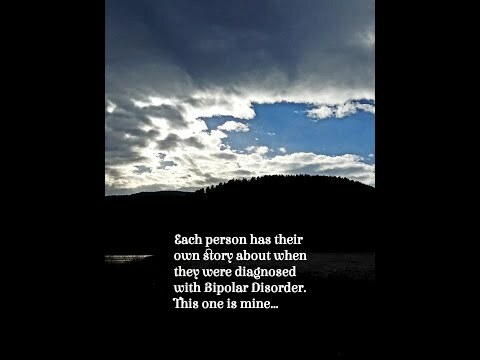 I want to help bring awareness to the situation. There's probably someone in your life that is self-harming and you don't know about it. Do you have a niece who wears long-sleeved shirts in ninety degree weather? There might be scars all over her forearms. Does your best friend's son refuse to take his hat off unless he's alone and behind closed doors? Maybe it's due to a bald spot on his head from pulling his own hair out. There's not much you can do for a person who is self-harming who doesn't want to stop. You can listen to what they have to say and don't place judgement. Don't tell him how stupid it is. Be the person they can contact in a crisis before making a cut. Don't get angry and yell. You'll only add fuel to the fire already burning inside. I'm not glorifying the subject in any way. It's an addiction and it's wrong. But some don't realize it. I'll let you in on a little secret. I still have the razor I used when I used to cut. I keep it with me all the time. Not because I'm going to use it again, but as a reminder of the deeper harm it caused resulting in permanent scars. Visibly and mentally.